For five hours on a rainy Sunday, the eyes of America were fixed on one thing. It wasn’t the first round of the NBA Playoffs or the final season of Game of Thrones. It was Eldrick Tont Woods, also known as Tiger, strutting down the fairways in Augusta, Georgia, with his trademark red and black Sunday fit, on his way to a fifth green jacket. On Sunday, April 14, Tiger Woods overcame a third-round deficit to claim his first major championship in 11 years and first Masters victory since 2005. Tiger’s 15th major title moves him closer to Jack Nicklaus’s record 18 career wins. Woods, 43, became the second-oldest player to win the Masters behind Nicklaus, who won his last Masters in 1986 when he was 46. It’s seems unusual to call this improbable comeback from Tiger a Cinderella story, but it is. This is fairytale stuff. You can smell the 30 for 30 being written right now. The weekend was especially magical because of the way he won. This year’s Masters was the first time Tiger had to come back and take the lead in the final round. He was calm and collected, masterfully hiding his emotions, and as the competition made mistakes down the stretch, he stayed consistent. Tiger shot a 2-under-par 70 on Sunday with 3 birdies in the final six holes to take the lead from Francesco Molinari and fend off Xander Schauffele and Brooks Koepka. When Tiger walked off the 18th hole to hug his son, you couldn’t help but look back and think about his embrace with his late father after his first Masters win in the exact same spot. It’s not silly to admit that I shed a tear because no one thought we’d get this feeling again. The average sports fan, especially college-aged fans, grew up watching Tiger every weekend. Since 1997, he’s been consistently in the news — whether for his dominance on the course or for his meltdown off of it. Simply put, Tiger was golf and golf was Tiger. No one in any sport captivates an audience like Tiger can, and it’s not even close. There is truly nothing like watching Tiger in the hunt in the back nine on a lazy Sunday. What Jim Nantz and the other commentators said is right: The roar from a Masters crowd when Tiger drops a ball right next to the pin like a machine or sinks a birdie putt is just different. Tiger brought one of the most exclusive and segregated sports to the mainstream, inspiring a generation of kids who would have otherwise never thought of picking up a golf club. He saved a tired, boring sport and made it cool. He made both new golf fans and people who already followed it super fans. This is what was missing from the sports world when he was out because of the list, too long to recount, of physical injuries and issues unrelated to golf. The PGA lost the casual fan when it lost the face of the sport. When he returned, Tiger was back, but he wasn’t back. The buzz was generating, but it wasn’t the same. Watching him limp around the course, struggling to even make the cut, was heartbreaking, and for a while, it seemed like we had lost Tiger for good. 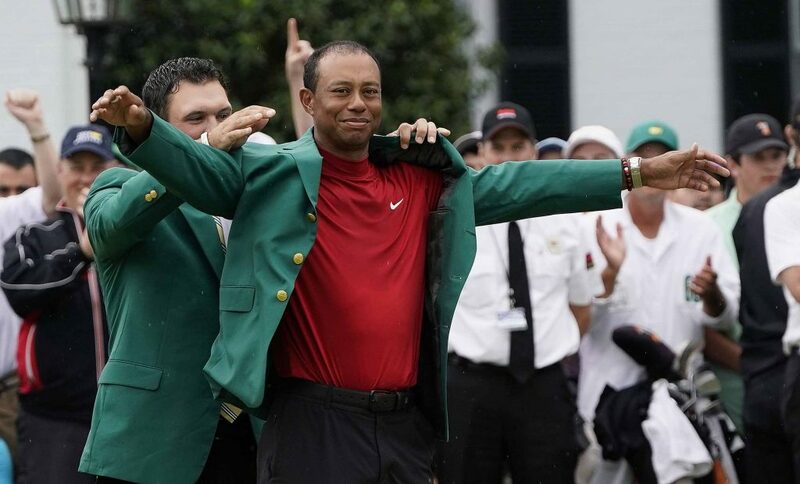 Patrick Reed helps Tiger Woods with his green jacket after Woods won the Masters Tournament on Sunday. AP Photo: David J. Phillip. The momentum had been building for the past couple of months as Tiger continued to inch closer and closer to the top of the leaderboards, and this weekend was the culmination of that. For sports fans like me, watching Tiger throw on that green jacket in Augusta brought back childhood memories of watching him swagger around the course with a three-stroke lead, knowing he was head and shoulders above the competition. That memory and nostalgia is enough to bring the casual fan back. This may not bring golf back to where it was, as the sport’s prime and Tiger’s prime are directly related, but that doesn’t matter right now. This may not repair his legacy in the eyes of those who condemn him for his actions off the course, but that doesn’t matter right now. 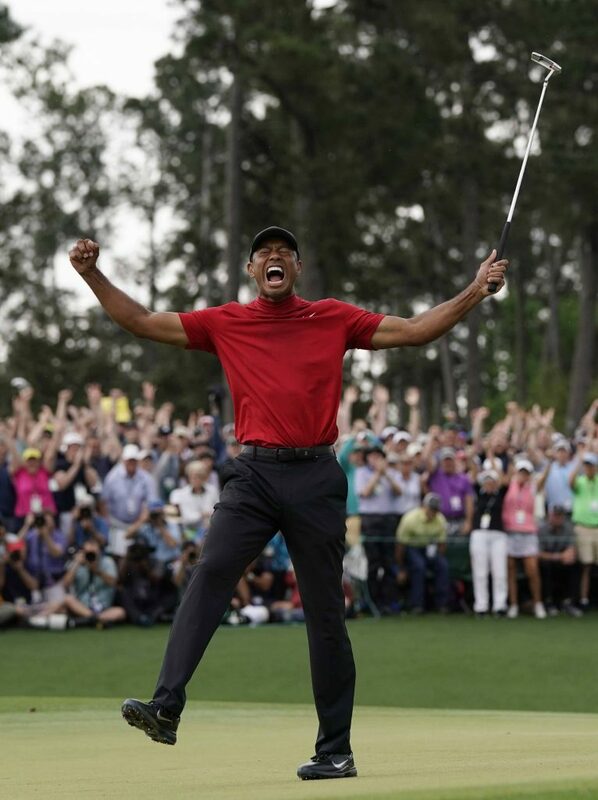 Today, we have this, a man taking his second chance and giving us the greatest comeback story in sports history and the ability to truly say this: Tiger is back.